The OTC 2004 features 4,000 pounds capacity with boom retracted and a 1000 pounds capacity with the boom extended. This folding floor crane has 3-1/2″ front wheels and 5-7/8″ rear casters and a boom reach of 25″ to 46″. Purchase OTC (2004) 4,000 lbs. Capacity Folding Floor Crane at Discounted Prices ✓ FREE DELIVERY possible on eligible purchases. The OTC 2004 features 4,000 pounds capacity with boom retracted and a 1000 pounds capacity with the boom extended. 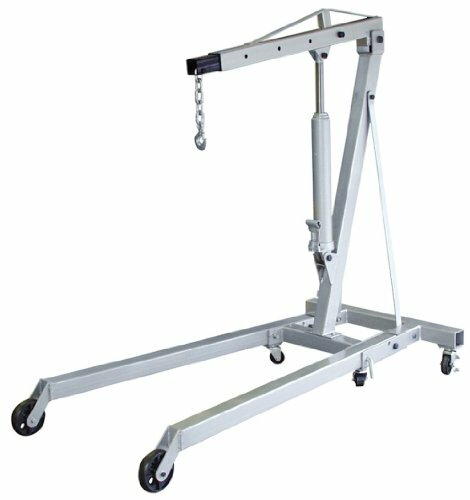 This folding floor crane has 3-1/2" front wheels and 5-7/8" rear casters and a boom reach of 25" to 46".